Happy belated Valentine's Day to all of you. Hope you had a safe holiday. I traditionally head out every week to wet a line, whether it is from the banks of my local horse pond or from the comfort of my kayak on some body of water. My planned trip for this past Friday was canceled due to a sudden temperature drop and a splitting headache, so I decided to take Monday off instead. The 60-70 degree temperature wasn't too bad of an incentive either. On Monday, I ventured over to the pond on the river and fished with a buddy of mine. The weather forecast was not promising for the entire day with forecast estimating afternoon winds at 30 mph+ with gusts of 40+. We got on the water around 9am and found the pond to be relatively quiet with no significant traffic. This time of year can find the pond area with boats of various shapes and sizes stacked almost on top of one another. The myriad of live lines and anchor lines turns this area into a minefield when trying to position yourself. We started working a new spot we had not tried before and learned that the fishing was going to be slow today. We spent the better part of 2 hours working the spot over with a variety of presentations and lures to no avail. The winds made boat positioning near impossible. I think I spent just as much time paddling and positioning as I did fishing. As the day wore on, the action and bite continued to be slow. Others in the pond area were experiencing the same challenge. We witnessed only a handful of fish being caught. Around the lunchtime hour, I got my first fish on a sea shad impersonation, a short one around 14". Shortly thereafter, my buddy landed a good 20+ inch trout that was released for another day. Then what little action there was slowed again, and no one was getting any bites. Almost all of the big boats left, leaving just three kayakers and two boats. Around 1:30pm, the wind was getting pretty stout, so we both beached the kayaks for a stretch and decided to wade fish for a bit before calling it a day. After 15 minutes of casting, I ended up hooking into something that put a nice bow in my spinning rod. For those new to the pond area, the tannins from the nearby swamp and all of the dead wood, stain the water to the point that visibility is limited to about 4-6 inches. Whenever you hook into a fish, you never really know what you have until you get it into the boat. After about a 30-45 second fight, my fish surfaces and is much bigger than I had thought. 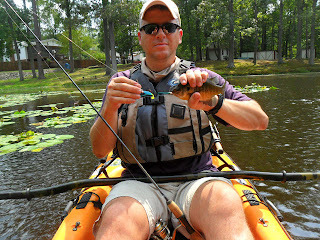 I was able to get the fish over to my kayak just as the 10lb. flourocarbon leader broke. I was able to get the Fish Grips on and positioned the fish on the measuring board - 20" on the nose or tail as it were. Shortly after that, the winds started to pick up even more, and we decided to call it a day. We landed three fish between us, had several more tease the baits with short strikes and nibbles. All in all, a good day on the water, albeit windy. The wind was so strong at times that the PFDs and paddles acted as sails and pushed us all over. Next time, I am bringing a sturdy anchor to at least give myself a chance at holding a position for more than 5 seconds. 3. See Mother Nature in her splendor and natural beauty. 4. 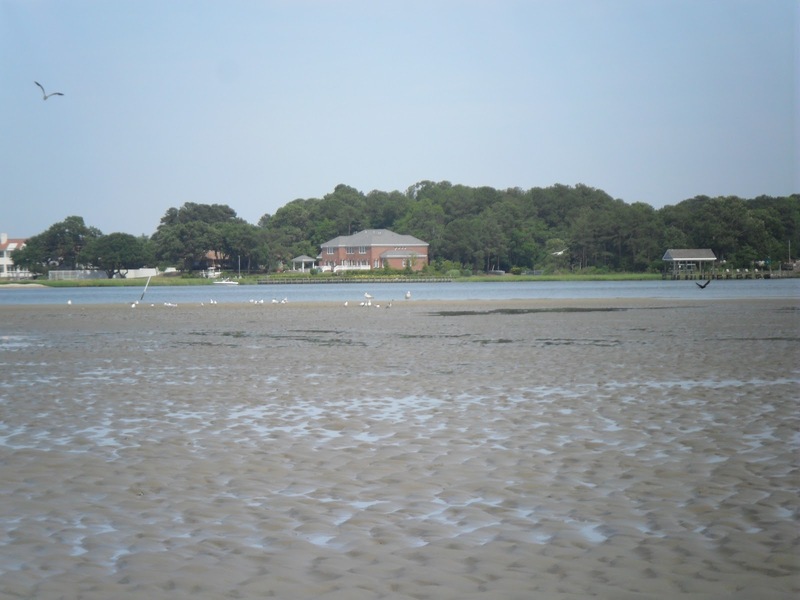 Make time to play on the sandbar. 5. Teach my son the importance of leaving the water cleaner than when you got there. His first Speckled Trout - a nice little 12" spike. The photo lends itself to how little interest he had in holding this fish for a glory photo. This little runt was flopping all over the place. He had apparently been caught before by someone who knew little of how soft the mouths are on specks. You can see in the photo how much of the Fish Grips jaws was able to fit clean through without touching any of the lip. We paddled back into Pleasure House Cove and saw plenty of mullet busting the surface making some nervous water, but we got no takers. 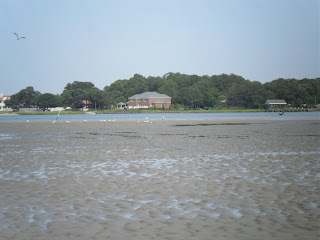 We saw a huge flock of White Herons working the shallows. We also saw countless turtles in the water but could not manage any photos due to their spookiness. Anyway, the tide started to shift into a falling tide, so I turned the yak a bit and let the tide do the work for us. Jacob started fishing again and so did I. I felt a "machine gun" of taps on my bait with some serious pullage. I thought that it didn't feel right, so I just created tension and kept reeling slowly - end result a fat blue crab had a gorilla grip on my jig. He let go as I was about to net him for a photo. He was huge with beautiful with bright blue coloration along his legs. 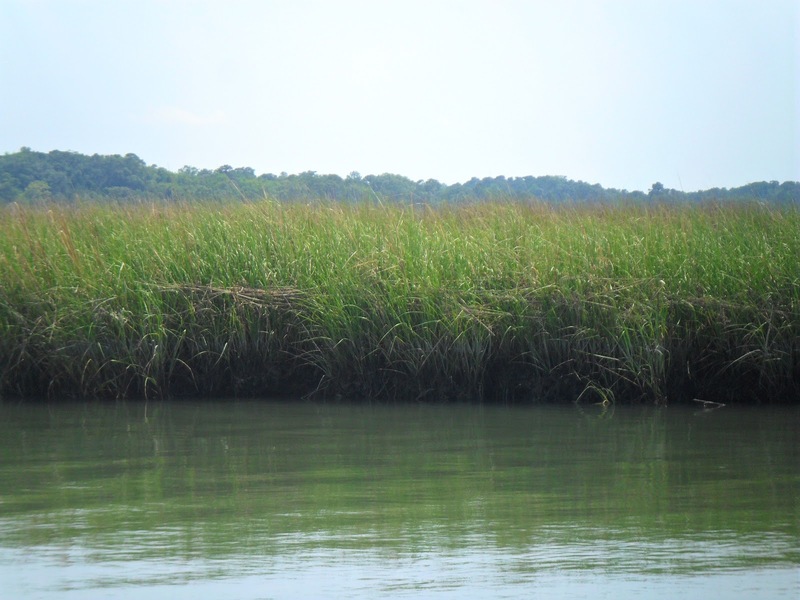 We drifted over towards Keeling Drain cutting through some of the creeks in the grass. The future redfish population looks promising if the number of fingerlings I saw make it to maturity - thousands of them today. By this point the water starting getting shallow, so I promised him we would stake out on the sandbar and let him play a bit before calling it a day. 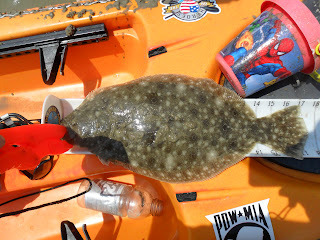 While he was playing in the mud/sand building castles and such, I hooked into a runt 10" flounder that decided laying on the HOOK 1 Hawg Trough was too much to ask, so he flipped sideways and bailed out of the boat back into the water. About 3 casts later, I get more "machine gun" nips, only this time it was a smallish croaker. We pulled up stake and walked down the sandbar to the end and setup shop again. He wanted to look for shells and play on the sand, so I let him. I made a cast up into the outgoing tidal flow and allowed the Gulp! Smelt to work slowly along. The rod almost lept out of my hands as I hook into something that has a bit more size to it. Not knowing how much of the pullage was tidal flow versus fish, I just maintain leverage and continue to reel smoothly. At first, the fish was coming at me right side up giving the appearance of a clear-nosed skate, but then it flinched and turned sideways. Flounder on!!! Notice the G2 bottle - this was just a sample of the trash we collected - one that he spotted!!! We ended up with a flip flop, a couple bottles, some random trash and some line in the garbage bag I threw away back at the launch. Shortly after catching this one, the tide went slack, and I knew the day was done. Lynnhaven can shut off like a light switch some days. So, we passed the time by letting him get some swimming accomplished in preparation for his refresher swimming lessons starting next week. All in all a great day of fishing with my son - 1 speckled trout, 1 croaker, 1 blue crab, 2 flounder and memories hopefully he will not too soon forget. On Saturday night, I pedaled around Rudee Inlet checking out the random parties and lights of the locals celebrating the holiday weekend. I had a few more Croaker and missed what felt like a nice Flounder. With the action dying off, I made my way from the ocean front inlet all the way back to the Owl Creek launch and headed home fighting sleep all the way. On Monday, I spent the day with a fellow kayaking friend (yakndave from KBF) in search of Flounder and Croaker on the York River. 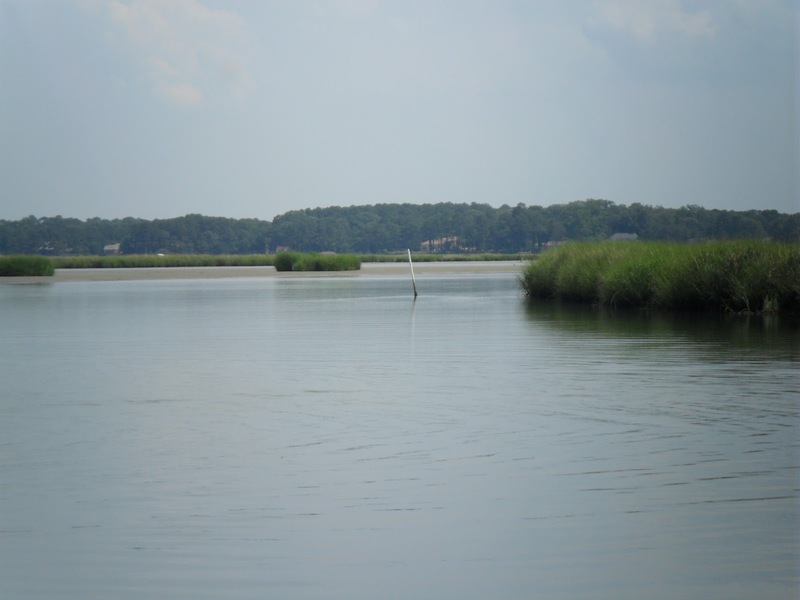 We launched out of Wormley Creek shortly after 8:30am and headed out. We were greeted and wished along our merry way by an Osprey at the mouth of the creek. 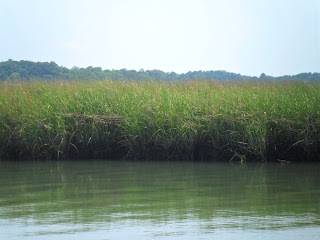 Shortly after we pass the creek mouth, we started pounding the grass line for anything that would take our offerings. I spotted a nice little cove with some nervous water, so I peddle over to find a couple fish chasing glass minnows all around but showed no interest. So we pedal back out into the main river and work our way down. We setup in 10-12 feet of water and tossed Gulp! Swimming Mullets and bait on a dropper rig. Dave lands a smallish flounder pretty quickly, and I ended up with a small Croaker before the bite turned off for about an hour. We contemplated calling it a day but decided to tough it out for an hour or so more. We each landed 6 or more Croaker with the largest measuring in right at 11". Croaker are feisty little fish and pull very hard for their size. This one below put up a fight much like a Smallmouth and fought for over 30 seconds. All in all - a good day and a bad case of sunburn to round out a terrific holiday weekend. Well, the weather was too iffy to chance taking a yak out, so the family opted for a little bank fishing with me at the trusty pond. We pulled up and were greeted by a body of water that was at least 4' below normal - Uh oh, this could be a short trip. Trusting my instincts, I had pre-rigged all 3 rods with the new Confidence Baits Draggin' Heads and small plastics. The wife had a Floating Bird in dark brown, my son a 3" stick bait in green pumpkin and myself with a small craw in green pumpkin. The wife hooked into one after her second cast. 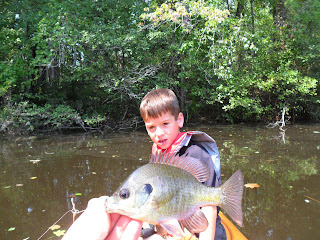 I landed one shortly thereafter, and our son hooked into one as well. At least we had the right presentation, and color was not a determining factor. We continued to fish one side with some manner of success, but we decided to move over to the opposite side anyway. 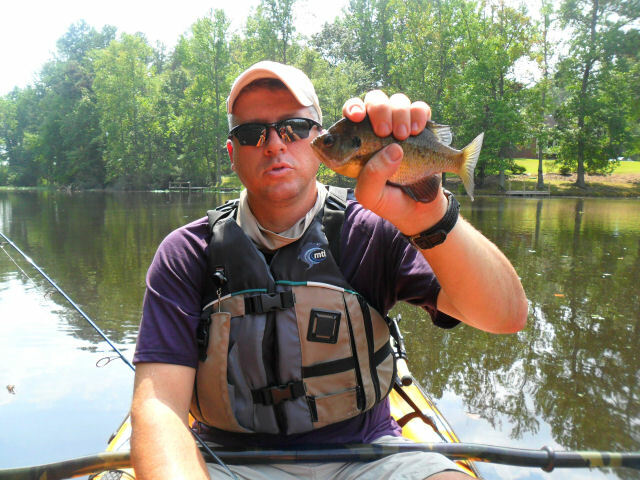 All three of us continued to see action with persistent hits and a few more fish landed. The new Draggin' Head is a perfect hook for the novice or school age young angler. It requires almost no action by the angler to get a decent hook set, and even fish barely hooked stay on due to the small diameter of the hook. As the action slowed a bit, I switched over to the Floating Bird in Lemon Pepper, and promptly feel something with a little more shoulders to it. I set the hook and am greeted promptly by a nice bend in the rod. A 30 second fight ends with my first Largemouth Bass of significant size on the new Floating Bird. We ended up catching 5-6 fish each and missed a few as well. Today was more about getting out of the house and avoiding a sedentary position even with the threat of bad weather. If you are an angler like myself who is looking for innovative products to make your fishing experience more enjoyable, I encourage you to try the new line of products by Confidence Baits - they are a top notch outfit and make quality products. As the founders will tell you, these baits are not just for Smallmouth Bass. They can be used on any species that targets living creatures that creep along the bottom of any body of water. My next outing will be in the salt water, so I plan on testing out the hooks and soft plastics and see how they fair. Until next time, tight lines and positive thoughts!! 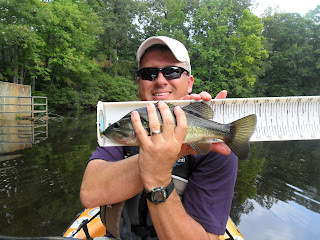 This past Saturday marked a first for me - a kayak only tournament sponsored by River Bassin'. The proceeds from the tournament went to fight ALS (aka Lou Gehrig's Disease). I entered the tournament in the Kayak Bass Fishing sponsored lake division, since I had fished Smith Mountain Lake on 3 previous occasions. My plan for the day was to hit the docks and any shaded banks with submerged structure. The plan was a good one until I learned a few days prior that the lake was now at 3-4' below normal levels. That meant that my planned target areas from past visits were now in 6-12" of water in most spots. It also exposed a number of targeted structure areas that no longer held fish, since they were now exposed and no longer below water. The day started off later than planned, because I had my son with me for the adventure and couldn't bring myself to wake him up at 4am after falling asleep only 7 hours earlier. I went ahead and got the van loaded with all of our hotel items and got myself ready for the day. He woke up on his own at 5:30am, and we hit the road by 6am with a quick stop for gas and some light breakfast fare. We make it to my planned launch to find the top water bite rather aggressive with a few stripers chasing baitfish in the shallows, including one massive blow up that my son spotted and resulted in a look of shock and awe. I unloaded all of our gear and parked the van. As we paddled out past the shallow launch, I noticed the onset of a headwind at the mouth of the cove. I decided to avoid this windy situation and moved in between some boathouses for some targeted top water with the Pop-R and some shakey head fishing along the pilings. After a few casts, my son wanted to fish a little knowing that any fish he caught would be ineligible for the tournament, since he wasn't entered this time. After a few minutes, he makes an errant cast that lands in the back of someone's boat and promptly gets snagged on the inflatable tube sitting in the cabin area. It's situations like these that make me pat myself on the back for preparation. I always carry with me a small pair of heavy duty bolt cutters (a tip learned from Jim Sammons). 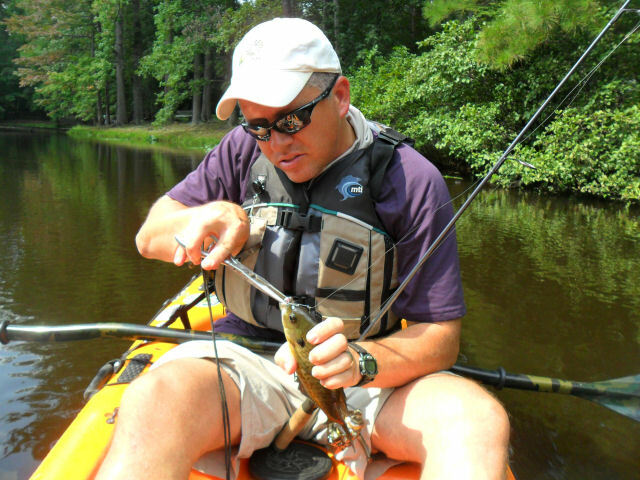 The bolt cutters are an easy way to quickly remove a hook that buries itself past the barb, whether it is in a fish's eye, gullet, your life preserver, your fishing pants, your arm or leg or in this case, an inflatable wave riding tube. A quick beaching of the kayak on the rocks and a quick trot into the boat house along the dock walk, and the barb was snipped off and lure/rod combo retrieved. Only damage done resulted in a lost jig head on his beetle spin which was quickly replaced. We re-launched and headed over to the eastern banks to fish the rocks and submerged trees, since the water was still slightly warm and the fish appeared to be somewhat active. I had four presentations rigged and quickly learned I had left the most critical one at my house - the lipless crankbait rod I had purposely tied on two nights prior to the trip. Oh well - lesson learned. I still had a rod rigged with the trusty spinnerbait that I could use. I started tossing that towards shore but couldn't buy a bite. I switched over to my favorite technique for locating bass holding tight to cover - a shakey head with a small profile soft plastic in a natural color like a green or brown. The lure of choice for this was a Confidence Baits Floating Bird in Dark Brown rigged on a 1/4oz. Draggin' Head pioneered by Jeff Little of smallmouth bass fame. I was throwing this little beauty using my trusty 6'8" St. Croix Mojo Bass spinning rod (Wackey Style model) and my Shimano Sienna spinning reel. I was spooled up with 30lb. Power Pro hi-vis yello braid and a 15lb. P-Line flourocarbon leader. I was getting several bites but no serious takers. I retrieved it slow at first by dragging it across the submerged tree limbs and branches. When that resulted in no takers, I also hopped it subtly, vertical jigged it and at times fished it a like a fluke with short, quick twitches - nothing serious just a couple short strikes. Still getting bites but no serious takers, I figured I was at least was in the right ball park as far as lure selection and presentation. I also had another presentation I started to use just in case - a jig-n-craw setup in 3/16oz. size with a small 3' craw trailer. I chose the pumpkin brown color, since that is the color that appeared the most natural when bounced along the bottom in the clear water. I had no takers at all, so I switched back over to the Floating Bird. We approached one boat house that had a huge opening between the pilings and looked like a prime ambush spot - lots of shade and positioned at the mouth of the cove on a submerged point. I used a slingshot cast to propel the lure underneath the boathouse almost to the other side and allowed the bait to fall naturally - like skipping a rock when you were a kid. I gave it a couple small hops and felt a solid bite. I reeled down and set the hook and immediately knew I had a good one on. I saw the fish turn and run for the pilings but was able to steer him clear. I thought for sure this one had a chance at getting me the big fish of the tournament if I could get it to the kayak. As I maneuver the fish clear of the boathouse, I feel the tell tale signs of the fish spinning and I know what the fish is - a dang catfish!! Not the hawg I was expecting to be sitting in that ambush spot. The catfish put up a nice fight and certainly scared off anything else in the immediate area, so we moved on towards the mouth of the main cove and were promptly greeted by a stiff headwind. We moved left of the cove towards my next target area - a wind blown main point with visible structure still below the recently receded water line. I opted to switch over to the spinnerbait first to see if there were any active feeders. I targeted the end of the main submerged tree by bouncing it off the tree branches on the retrieve but no takers. I move my casts further in towards the bank and cast the lure into a pocket that had visible submerged main branches creating a pocket that looked "fishy". A pretty good cast and couple twitches of the rod to get the willow blades moving, and I was promptly greeted with the tell-tale double chomp of a largemouth bass. 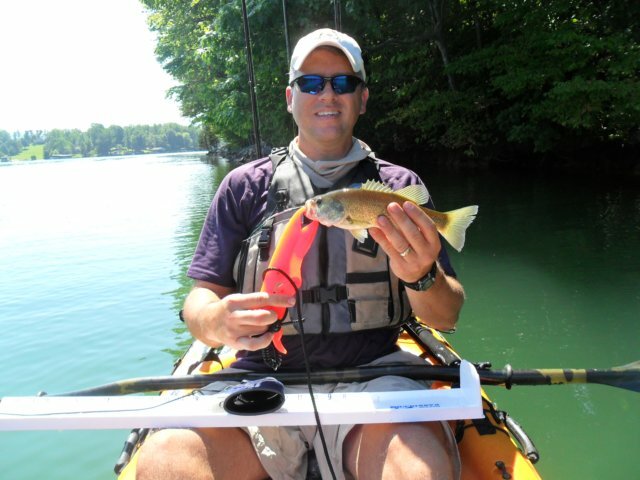 I set the hook and immediately feel the kayak surge towards the fish. Big fish on for certain. A couple quick jumps confirm what I thought - a hoss or as Mark Zona says all the time on ESPN - a biggun!! I had him halfway back to the boat when he makes a tarponesque leap and twitch, and I can see I have him hooked dead in the roof of the mouth. I had good leverage on him and lowered the rod to prevent him from tossing the lure from his mouth. Almost got him......and SNAP!!! Line break - say what? How in the world did he snap a 15lb. flouro leader? The momentum of the fight combined with the wind at my back pushed me over to where he snapped the line. I look down and see the reason for the lost fish - a recently downed tree that had fresh sharp edges and contributed to me losing a quality fish. Such is life - not the first fish I have lost, nor will it be the last I am sure. You always hear the fishing adage and words of wisdom that if you are not getting your lure snagged or hung up, then you aren't fishing in the right spot!! Well, I confirmed that one right there. I kept working the cove nevertheless with nary a bite to be found. What made the lost fish more painful is that he spent the next 15-20 minutes jumping out of the water left and right trying to get the spinnerbait out of his mouth. Dang fish - grrrrrrrr!!! Oh well, I told my son to always keep your head up and just keep trying. Persistence pays off, right? I was getting pretty worn out fighting the wind and the lack of any action as the sun rose high above our heads, so I beached the kayak in a small shallow spot at the back of the cove and pulled out our lunch. 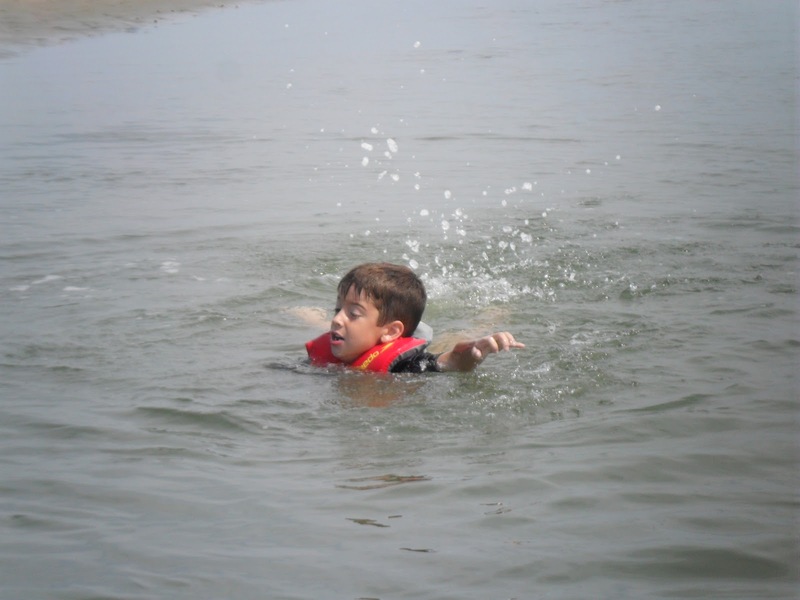 My son waded around in the shallow water stirring up the muck while munching on his sandwich. I ate mine as well, and I decided to change a few of my setups around. I tied on my favorite small spinnerbait, and I re-rigged the wackey style rod with a heavier round shakey head and just a brown/orange colored soft plastic craw. Once I was done with my sandwich and the retying of the lures, we made our way back towards the launch to fish the shaded side of the rock covered banks with overhanging trees. I knew we needed to be off the water by 2pm in order to not be rushed and to have enough time to load up the gear and kayak and make the drive back to the check in by 4pm. I found a target rich area that had several submerged trees in deeper water away from the banks. I tossed the craw away from the banks first to try an target the fish at the end of the structure. Nothing. I worked the craw closer to the banks but still nothing. I then cast the craw up onto the bank, then started a short hop retrieve mimicking the action of a crawdad fleeing from prey with sharp twitches of its tail. I let the craw fall and felt a subtle tap. I waited a brief moment to avoid losing another fish to a short strike. I love the hi-vis braid, because even subtle hits are magnified when the fish swims away with your bait. I saw the line begin to swim away and set the hook - fish on. Nothing big, but still a keeper per the rules of this tournament of an 8" minimum. A few short runs and the first fish of the day that counts is in the boat. I put him on the Fish Grip that I have tied to the kayak to let him swim freely while I got the measuring board and identifier out to take a photo. End result - a spunky little 11 1/4" bass to put on the board - nothing to write home about but at least no skunk. Here is the photo my official cameraman (aka my son) snapped for me. If you look over my left shoulder (right side of the photo), you can see how much shade the trees were providing on the shallow banks even at high noon, making it a prime target area in the crystal clear water for the day. I kept working that area knowing that the submerged trees had to hold more than one fish. I found another taker and hooked him but he was able to get off by swimming into the tree and managing to get the lure hung up. I knew I was onto some form of a pattern of fish tight to cover but still aggressive. I continued to get bit with several instances of the fish biting hard and ripping the claws off of the soft plastic crawdad but no more were landed. 2pm came all to quickly, and I was forced to resign with only one fish to record. We make it back to the tournament check in with 6 minutes to spare, albeit after getting caught behind every pokey person in the state and caught at every red light!!! I know that if I could have landed those two fish that got away, I would have had a chance to win the individual angler and big fish awards. I ended up placing 6th out of 10 individuals in the lake division. The winning total I believe was only 33" for the two fish he landed with a three fish maximum. Oh well, it was fun to say the least. My son had fun taking photos, we caught a couple fish (albeit one not able to be entered), we won a couple raffle items, met some new faces like Jeff Little and Drew Gregory, we spent time together on the road in a hotel for the first time, and we got to fish - not too bad of a weekend if you ask me. Labor Day weekend is always a quandary for me - do I venture out on the highways to get to the salt or some prime fishing waters like Sandy River, Briery Creek or the Doah and fight traffic all the way home, or do I tough it out locally and take what I can get. Since I got a late start today, I opted for the latter. I asked my son if he wanted to go, so we could re-visit the site of the infamous 21-4 rout he gave me a couple weeks ago. He quickly turned his head and almost leaps out of the house to the van. I forewarned him that fishing this late in the morning, especially after Irene dropped a ton of debris in the pond, could make for a long and boring day on the water. There is just no way to tell until you get out there and try your luck. Well, I loaded up the kayak and packed some frozen waters, his medium combo and a couple of my light rod combos along with his panfish tackle tray I put together for him and headed for the pond. I kept working the shoreline looking for any pockets of shade next to lily pads, overhanging trees or docks. The pattern seemed to be a slow retrieve, almost too slow but every time I doubted that technique a fish strike followed in short order. You can see the lily pads offer some escape from the sun, but there are still plenty of pockets to work a non-weedless lure like the beetle spin I was throwing at them today. I quickly learned after losing 3 gills, a chain pickerel and a chunk of a bass that my combo was not the best outfit for the day. The rod has almost no backbone and is difficult to get a good hook set. My son quickly volunteered his combo telling me that all the fish I would catch would be his fish, since it was his rod and reel.......you gotta love the thought process of a 6 year old. The wind started picking up making it difficult to maintain position back in the cove of lily pads, so I paddled over to the over flow drain and started working the shoreline pretty rigorously. A few casts after this approach landed me the best bass of the day - a chunky little 14" with lovely coloring. By this time, the sun was high in the sky and beating down on us pretty hard. The bite had slowed to a crawl with few hits over the course of the next hour. I asked my son if he wanted to try again, and he said no. He just wanted to take pictures for me - how cool is that? So, I got back to it and paddled back into the far cove looking for some more fish. Ended up catching a dozen or so more bluegills back in this cove, including this chunker - a 10 1/2" bluegill. Unfortunately, no measurement picture was able to be taken. 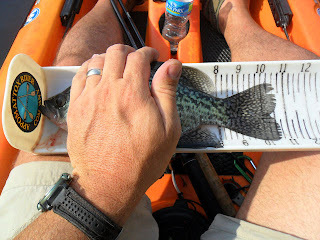 My son had put the camera away, and the gill spiked me good while I was trying to position him on the measuring board. No worries, he'll be there the next time I come back with my son. I notice my son is getting fidgety, so I asked him if he wanted to fish anymore. He asked if we could switch colors, so I said sure - pick out which one you want. He picked out the classic beetle body in white with the red spot. I positioned the kayak to let him cast up to the next batch of shoreline pads, but after 3 half-hearted casts, he decided he just wanted to take pictures. I reassured him that the white one would catch fish. I showed him where to cast and started a slow retrieve that was greeted by a prompt thump. I saw the fish flash in the water, but he spit the lure and swam away. I reeled it back in and recast to the same spot, only this time I was able to set the hook. End result - a nice little black crappie. 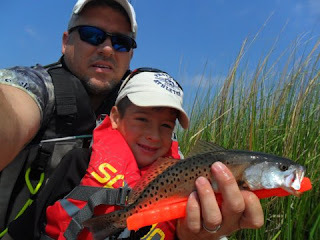 All in all a great day on the water with my son even though he lost interest pretty quickly due to the apparent lack of a bite. I tried to remind him that some days are better than others. We caught the same amount of fish as we had the previous trip, only this time the shoe was on the other foot so to speak. Final tally: 24-1 in my favor but I didn't make mention of it. At least he enjoyed taking photos, but now it looks like I need to invest in a camera float with wrist strap and a waterproof camera quickly!! !